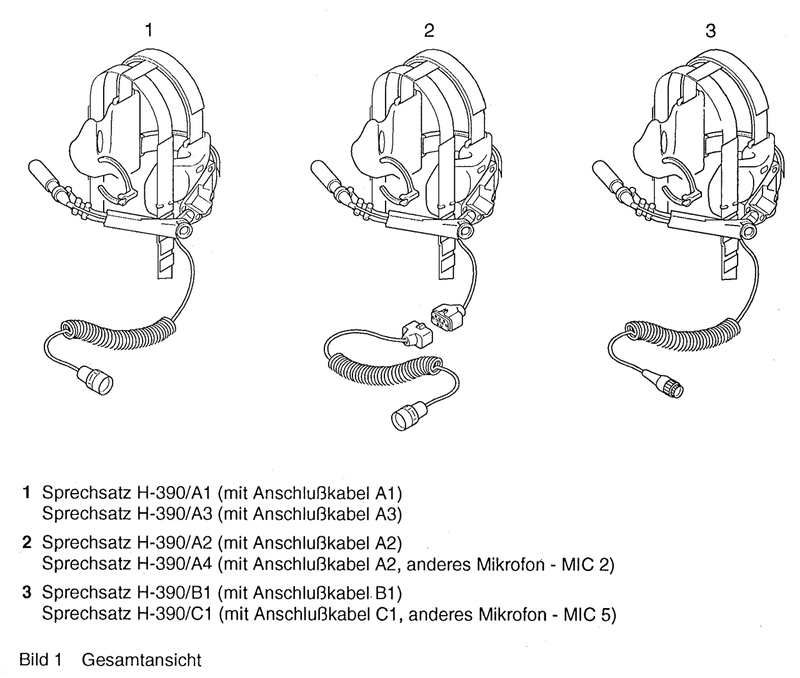 This is a German audio test set from the late 1980s. Took a few months to arrive from Helmut Singer. I just received it and so don't have a full understanding of what it does. 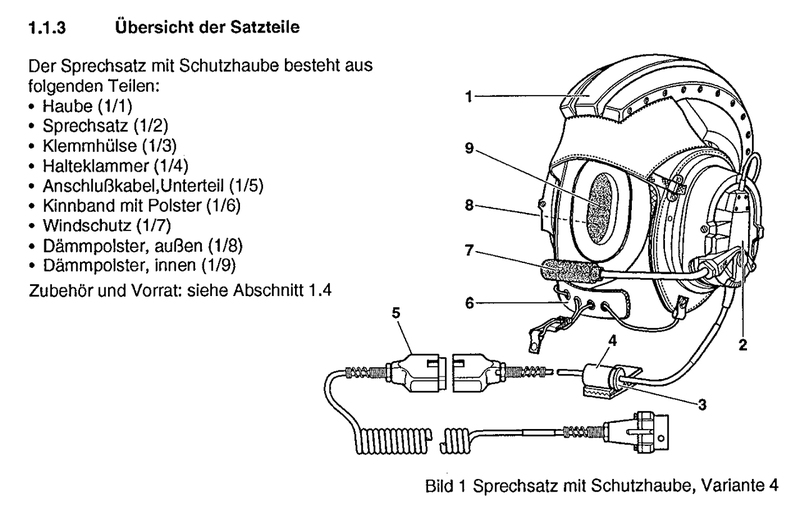 The manual and panel markings are in German. Based on the low serial number (33) and lack of a contract number I'm guessing this was part of a pilot run rather than some fielded equipment. 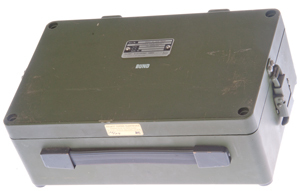 A NSN search turns up a handful of hits also indicating that this is a prototype or low production item. I've heard these were made in quantity and used long after the Korean conflict since many German military radios continued to use the U-77 series audio accessories. 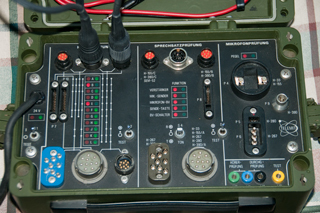 Military audio accessories have features that are common to the application. 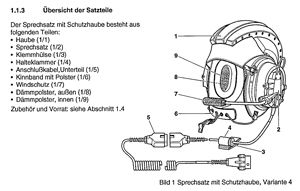 For example combat vehicle crewmen typically have a helmet that holds the earphones and either a throat or boom microphone so both hands are free. Also there needs to be a way to direct the microphone to either the radio or the intercom. In addition there needs to be a quick disconnect for emergency vehicle egress. 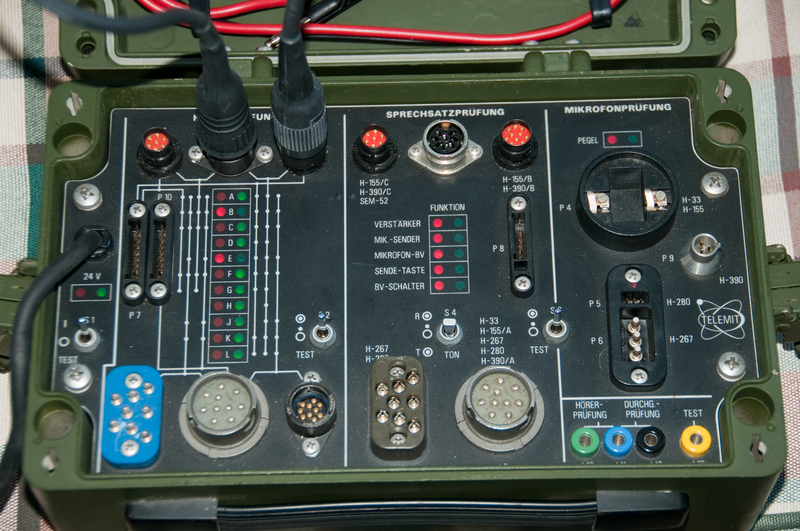 The H-161 is a combat vehicle headset. 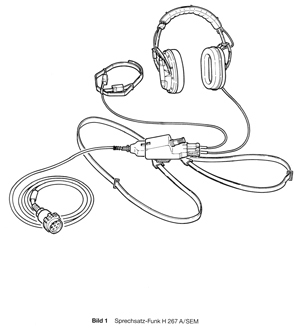 These headsets can be separated into three parts: The cable that connects to the radio (or intercom) and the bail out connector, the cable between the bail out connector and the switch box, the cable from the switch box to the headset proper. 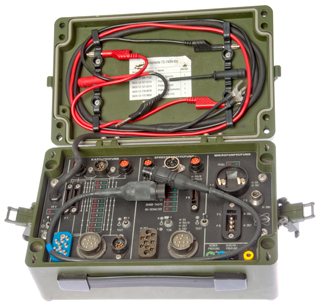 This TS-2839 test set can test the above cables, the switch box and the microphone and speakers in the headset. Note the front panel (Fig 3) legend which shows a line with dots adjacent to the column of red and green LEDs for each of the connectors. Which shows which LED are applicable to that connector. 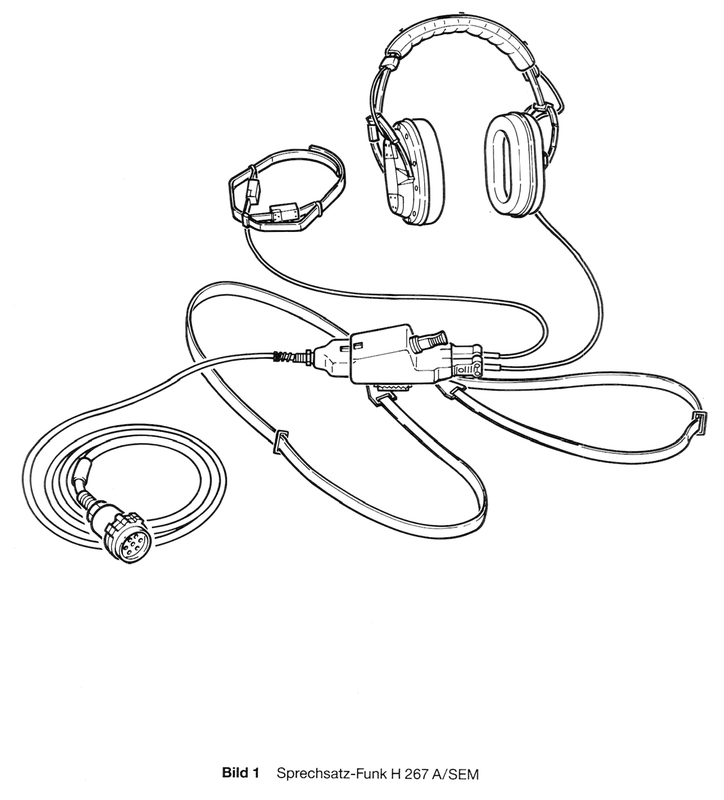 For example the UG-77 10-pin AUDIO connector has dots next to rows: A, B, C, E, F, J & K. Also the same line goes to other connectors in the Cable Test area showing what cables can be tested that have different connectors on each end. Note that which LEDs (pin letters) are active depends on the connectors on both ends of a cable. The maximum number of paths is set by the end connector with the lowest number of pins and the total number of pins may be even lower than that. But in any case for an specific cable the dots on the line associated with those two connectors show the active pin letters. Missing is the type U-229 Jack! This is probably why this unit is on the surplus market since most modern equipment uses this connector. The U-77 is a Korean Conflict era connector. 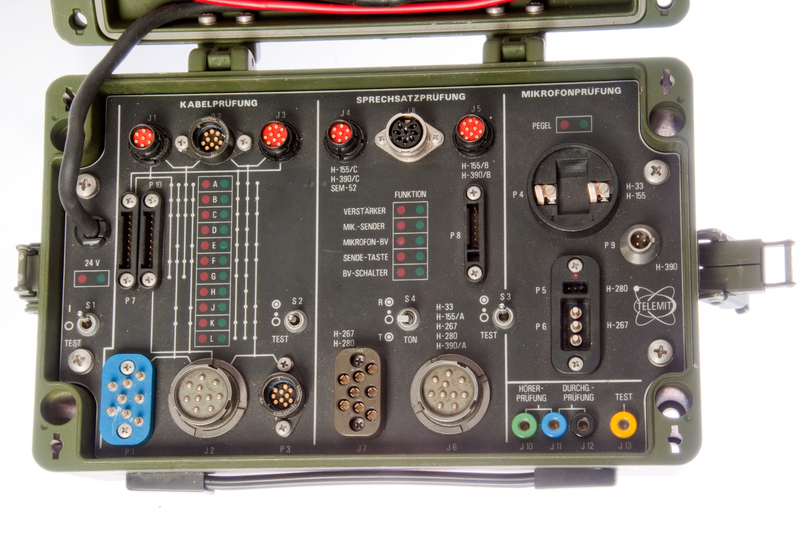 Note this connector is associated with handsets like the H-33 which use a carbon mike. So maybe the other cable ends associated with this connector (P10, P1 &P3) are also carbon mike vintage connectors? S2 is a three position switch where the center position is Off, i.e. The Cable Test section is not active. On: continuity is being tested, Red is an open and Green is a good circuit. TEST: without any cable connected turns on all the green LEDs. 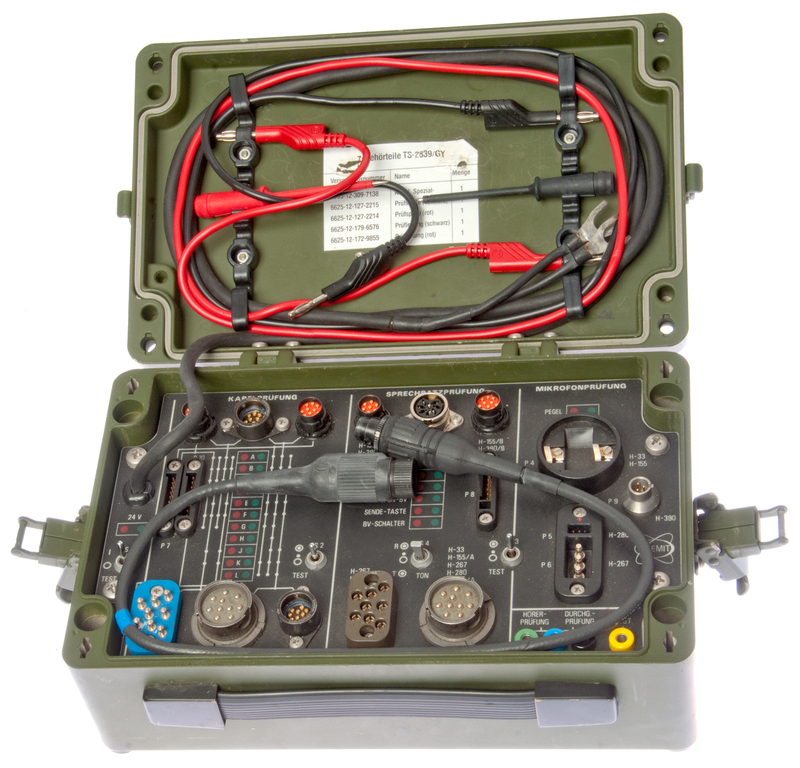 See Fig 4 below with the test set powered (S1: On), a 10-terminal male-female cable connected and S2: On. Terminals labeled "B" and "E" have red LEDs indicating that they have open circuits. There are 11 rows of LEDs with each row containing a red and green LED. The rows are labeled: A, B, C, D, E, F, G, H, J, K, L (note common military idea of skipping I which can be confused with 1 and l). My best guess is that this area is for testing the PTT function, but the LED table seems to be doing something with the microphone circuit. 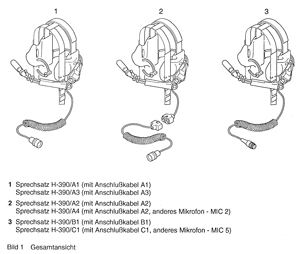 Maybe that's related to the section just to the right that has to do with Microphone test (S3 is common to both sections). S4 ( 1kHz tone) in inside the PTT Test area and has positions On/Off/Momentary with On corresponding to "R" and momentary corresponding to "T". There are 5 rows of LEDs with green and red on each row. The translations are my best guess. At the top of the area are a red and green LED with the label pegel (Level). When you speak into the microphone the LED should flicker. Note: If it's a noise cancelling microphone, like the M-80 or H-250, then the mike needs to be toughing your lips to prevent your voice from being canceled. This is not at all clear. Note in the lid there are red and black test leads with matching red and black probe tips. Loose cable has 10 terminals and is an extension.